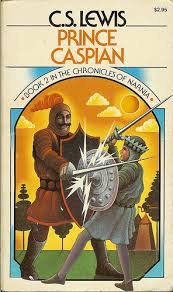 Upon finishing our last Narnia read, the kids asked if we could immediately launch into Prince Caspian, a request to which I will never say 'no'. When the kids ask for time in Narnia, they get it! Prince Caspian is not my top favorite of the Narnia stories so I don't know it quite so well. I often find myself saying, "Oh yeah! I had forgotten...." while reading. Bookworm2 likes Prince Caspian because it has exciting battles. Actually, I had quite forgotten just how exciting these conflicts are. Two heads are sent rolling during the fighting and I was wondering how the Bookworm's were going to take that information. They didn't seem phased but it made me cautious about having them watch this film. I can't remember what the battle scenes are like in this movie adaptation (because this is also not an adaptation I care for a great deal). Does anyone out there remember? Reading about it is is one thing, visualizing it is another. As I like to do when reading Narnia, I like to point out particular passages which stood out to me as being exceptionally moving and process my thoughts a bit. I'll do the same in this case. The first passage that caught my eye is when Trufflehunter and Trumpkin are introducing Caspian to Old Narnia and are in process of drumming up an army to battle against Miraz. They are at the cave of the five Black Dwarfs who accept Caspian as king on the basis of the fact that he is against Miraz. However, they are concerned that they do not have enough power on their side in order to defeat Miraz. "Shall we go farther up for you, up to the crags? There's an Ogre or two and a Hag that we could introduce you to up there." "I should think not, indeed," said Trufflehunter. "We want none of that sort on our side." These few sentences pack quite the punch if you stop and ponder for a moment. I believe it to be very true that Christians in every age are prone to the same weakness: that of fear. Circumstances frequently have a tendency to look rather glum. It might be a political situation, or a personal relationship issue that we're dealing with, or some unnamed hurdle in our lives that we just can't seem to jump. Either which way we fear that we will not have the ability to make it through the difficulty without assistance. This feeling of fear can actually be a good thing when and if it reminds us that our hope and only hope of real help is found in Christ Jesus. If fear turns us in His direction and causes us to cry out to Him to help us through our various trials and circumstances than, truly, all is well. The problems usually exist because we feel like we need assistance that we can see and touch. We so quickly forget that God has promised never to leave us or forsake us and that He will be our help in times of trouble. Bad circumstances that remind us of this are actually good circumstances. When the chips are down and your back is to the wall that's when God is standing at the ready to glorify His name in and through you. "Be of good comfort, Mr. Ridley, and play the man! We shall this day light such a candle by God's grace, in England, as I trust never shall be put out." Play the man, he says! The flames were hot. Death was the only option and they could only cry out to the Lord for death to come quickly. Note that neither Latimer or Ridley tried to deny the inevitable. They didn't seek help from evil sources. They did indeed "play the man" which, in their case, meant suffering a martyr's death. They died to self with a clean conscience of not having given in to "an easy out" to relieve them of their burden. Their backs were to the wall. There was no escape. They sought comfort in Christ which gave them the strength they needed to just make it to the end. Their names and their story are an encouragement to others, a candle was lit to save others who were wallowing in darkness. Their words and their attitude declared, "This looks bad! But God means for good. Let's trust Him for that good!" Could you do it? It would be a hard thing. But we each have our own trials that come along and question whether we will 'play the man' or seek out ogres and hags. Their ogres and hags could have been escape for the Narnians, but at what ultimate cost? At various times and places my hags and ogres look different. I see an "easy out" or a "sure way" out of my troubles and I feel inclined to take it. But we must "have none of that sort" on our side as we run this good race which the Lord has put before us. Whether your struggle be with family, with friends, with the church, or whatever - when your back is to the wall, look up! Aslan does exist, though in this world we know Him by another name. Take courage in knowing that your outcome in Christ is secured! Do right even when it looks to be hard. Play the man. Or, if you will, play the badger. They never forget the past and hold on to the promise of victory. The next passage which spoke courage to my heart was when the Pevensie children were talking about the magic that brought them back to Narnia. They were debating whether or not they really had any choice in coming or if magic had compelled them. "But we want to be here, don't we?" said Lucy, "If Aslan wants us." Lucy just makes my heart sing, that's what! No matter what brought us to a certain place in our lives - shouldn't we want to be here? That is, if the Lord wants us here? Life isn't all fun and games as we all know. 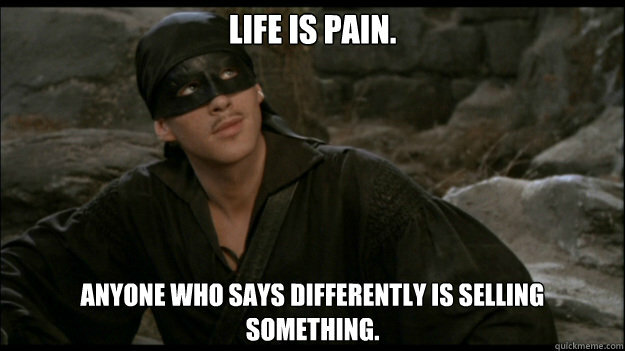 (And if you don't know it then I question how you've been living your life.) It is hard and painful and we get bumped and bruised quite a bit as a result. There is nothing unusual about this and no one should be surprised or feel singled out for hardship. But there is good news and here it is . . . are you ready for it? 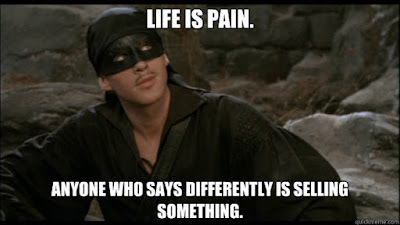 The pain has a purpose. The purpose? To drive us to Christ. We don't always get to chose the circumstances in our lives but it is a good question to ask, "Shouldn't I want to be here? That is, if the Lord wants me here?" I want to be right here. Right now. In this time and in this place that God has placed me, surrounded by the people He surrounded me with. It isn't always easy, but I trust that whatever my God ordains is right.